ABUJA, NIGERIA (ANS, Oct. 24, 2016) — The 21 girls released by Boko Haram Oct. 13 have met President Buhari to thank him personally for his part in their release, according to World Watch Monitor (www.worldwatchmonitor.org). CNN reported that a parent who wished to remain anonymous said on their release last week one girl revealed more about life in captivity. The parent said that one of the girls had refused to marry a Boko Haram fighter and was told she would be killed. In the end she was given 100 lashes. CNN said it’s hard to imagine that the girls, now giggling and chatting among themselves, were at the mercy of one of the world’s deadliest terrorist organizations just one week ago. CNN said as the Chibok girls waited patiently Wednesday to meet the man who signed off on their release — Nigerian President Muhammadu Buhari — it was remarkable to see the physical transformation from emaciated and haggard looking former hostages to seemingly carefree and happy young women. CNN said the faded and torn clothes they arrived in have since been replaced with tailored and brightly colored fabrics that concealed their still painfully-thin frames. In their first interactions with any media organization, CNN’s Isha Sesay met most of the 21 girls at the meeting held at the presidential villa. The Chibok girls met Nigerian President Buhari at the presidential villa in Abuja, Nigeria’s capital. One of them, Rebecca Mallum, was chosen to thank the President and address the crowd. As she rose, Mallum burst into song and the other girls stood to join her. CNN said, however, that underneath the quiet and withdrawn smiles of the Chibok girls lies the unimaginable horrors of their time in captivity. Boko Haram kidnapped 276 girls and women, ages 16 to 18, in the middle of the night at a boarding school in Chibok, Nigeria, in April 2014, drawing global outrage. Scores of the girls remain missing. CNN has spoken to a parent who said their daughter has revealed some of the ordeal that she and her classmates went through. The parent, who asked not to be named because of safety concerns, told CNN that during their time with Boko Haram, the girls were forced to build their own basic shelter, using plastic bags for roofing. According to the parent, one of the Chibok schoolgirls had refused to marry a Boko Haram fighters and was told she would be killed. In the end, she was given 100 lashes, the daughter said. On the day of release last week, the parent was told by their daughter that Boko Haram lined up the girls early in the morning and read out their names one by one, they were then told they would be set free. CNN said the Chibok girls now face a long road to recovery. Some have expressed a desire to return to school but for the time being, they remain in a medical facility in the capital Abuja where they are undergoing intense psychological evaluations. The Nigerian government says it is now time for them to experience the best of what life has to offer. Buhari promised to take over responsibility for their welfare and personal and professional goals. 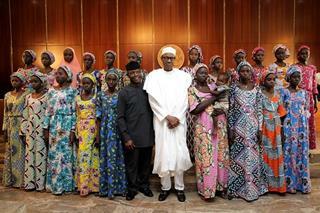 Photo captions: 1) Freed schoolgirls meet with President Buhari in Abuja. 2) Joy and tears as schoolgirls are reunited with parents. 3) Michael Ireland. 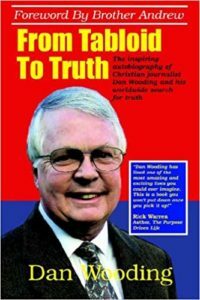 A Matter of Faith — And Here’s the Good News!